I’ve been dancing around the outside of my core favorites, but can’t resist any longer. I love Trek. I love Trek films. And I love the Enterprise. 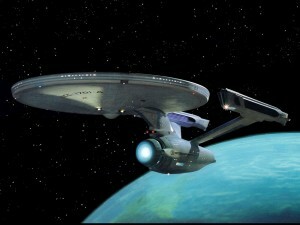 Specifically, I love the NCC-1701-A. Whether exploring the depths of V’ger, taking on Khan, or heading for the second star to the right, Enterprise is as much a character as Kirk. She’s taken a beating, been completely rebuilt, and eventually replaced with a later model. But this version is my favorite, and always will be. Then again, that 1701-E is a slick beast, and sports the coolest escape pods in Starfleet history. Heck, throw her in there, too. It’s an Enterprise love fest!